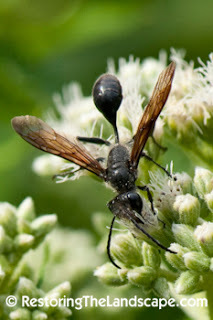 Restoring the Landscape with Native Plants Article Grass-carrying Wasps ~ Isodontia spp. 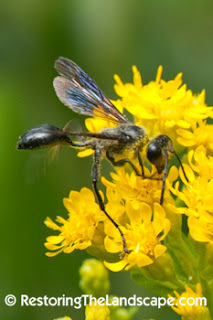 Grass-carrying wasps are a flower-visiting solitary wasp, common in late summer and early fall. Because they are solitary-nesting, and not colonial like yellowjackets or hornets, they do not sting humans to defend their nests. It’s an important distinction to make with wasps in our landscapes, so many are solitary and not aggressive. 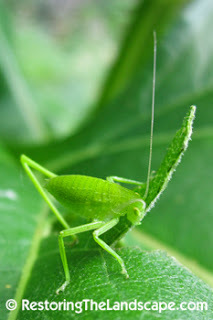 They perform important ecosystem services, pollinating the plants in our landscape, and preying on foliage eating insects, crickets and katydids in particular. Females look for prey, stinging them several times to paralyze and immobilize them. They carry their prey back to their nests, which are preexisting cavities such as hollow stems or holes bored in wood. The prey are stocked for their developing larvae to feed upon. Using nearby grasses, nests are divided into sections with pieces of grass, they also close the end of nest with grass. If you erect a mason bee nest board (board with nesting holes drilled in it), grass-carrying wasps will sometimes build nests in the cavities. Look for pieces of grass sticking out the ends of the board holes or plant stems. I have several different variations of stem nests hung in the yard for solitary bees (and wasps), this one in particular has been utilized almost exclusively by grass-carrying wasps. Cup plant and pale Indian plantain stems work extremely well, both are hollow. Here’s a cross-section of one of those stems with the wasp larvae and stocked prey. 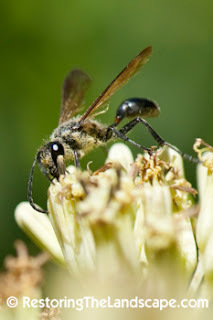 In my yard, the grass-carrying wasps like to use little blue stem to seal off the cavities. Look for grass-carrying wasps in late summer. In my yard, they like to visit stiff goldenrod, common boneset and pale Indian plantain flowers for nectar. If You Are Interested In Purchasing Our Pollinator Seed Mix Please Visit Us At Our Website Native Wildflowers & Seeds From Ion Exchange, Inc.
Echinacea from the Greek word for “sea urchin” or “hedgehog” referring to the spiny chaff at the center of these flowers. Pallida is from the latin word for “pale”. Perennial; reaches 2 to 3 feet; leaves are mostly basal and elongated ovals up to 7 inches long. Single, pale purple flowers top a stem with a few stiff hairs and few leaves. Favors open prairies and dry open woods of the Tallgrass region; occasionally found along undisturbed roadsides. Blooms from May to July. Native Americans of the Plains are said to have used Echinacea for more medicinal purposes than any other plant group. The root (chewed or brewed in a tea) was used for snakebites, spider bites, cancers, toothaches, burns, hard-to-heal sores, colds and flu. Current science confirms a cortisone-like activity as well as insecticidal, bactericidal and immuno-stimulant activites. It is still considered a nonspecific immune system stimulant. There are over 300 pharmaceutical preparations made in Germany including extracts, salves and tinctures used for wounds, herpes, sores, canker sores and throat infections. It’s also a preventative for colds and flu. An old folk remedy claims success as a treatment for brown recluse spider bites, but it is not known how the plant was prepared for this remedy. Medicinal Uses: Plants in this genus were probably the most frequently used of N. American Indian herbal remedies, though this species is considered to be less active than E. angustifolim. They had a very wide range of applications and many of these uses have been confirmed by modern science. The plant has a general stimulatory effect on the immune system and is widely used in modern herbal treatments. There has been some doubt over the ability of the body to absorb the medicinally active ingredients orally (intravenous injections being considered the only effective way to administer the plant), but recent research has demonstrated significant absorption from orally administered applications. In Germany over 200 pharmaceutical preparations are made from Echinacea. The roots and the whole plant are considered particularly beneficial in the treatment of sores, wounds, burns etc, possessing cortisone-like and antibacterial activity. The plant was used by N. American Indians as a universal application to treat the bites and stings of all types of insects. An infusion of the plant was also used to treat snakebites. The plant is adaptogen, alterative, antiseptic, depurative, diaphoretic, digestive, sialagogue. It is harvested in the autumn and dried for later use. To Purchase This Beautiful Wildflower Visit Us At Our Website Ion Exchange, Inc. It was snowing, but the mid-day light was still bright enough for photography. As the snow fell, I stood in my coveralls near several bird feeders, hoping the birds would ignore me. I had covered my camera in a plastic bag and wrapped my lens in cardboard (held on with rubber bands) – only the best technology for me! While the snow piled up on my camera, eyebrows, and beard, I pivoted the camera around on my tripod, attempting to focus on bird after bird as they came near the feeders. Most of the time, of course, the bird either landed in a non-photogenic spot or moved away before I could get a bead on it. In spite of that, I eventually managed to get a few useable shots. This one is my favorite from the day – mainly because of the completely white background. It would look like a studio shot except for the blurry snowflakes coming past the tree trunk. In reality, the snow on the ground and in the air behind the bird just blurred together into a pure white background. Why Are Some Wild flowers Highly Scented with Brightly Colored Petals? Question: Why Are Some Wild flowers Highly Scented with Brightly Coloured Petals? Top Answer: Some wild flowers are highly scented with brightly colored petals so as to attract pollinators like insects and birds. The pollinators feed on the nectar and help in distribution from pollen grains from anthers to stigma of the same plant or another plant. This enables continuation of reproduction. To Purchase Native Wildflowers & Prairie Plants Visit Our Website At Ion Exchange, Inc.
To Purchase Your Native Wildflowers & Prairie Plants Visit Our Nursery Website At Ion Exchange, Inc. Many bird-feeding stations are barren of cover for birds at your feeders. You can solve this problem by providing instant cover with fully mature fall or winter-harvested stems of the White Wild Indigo. When the plants mature and fall comes, the plants will go dormant leaving their study and durable stems erect with dried leaves and stems still in tack. This makes for the perfect little bush that will give birds a secure place to land. Just break the stems off at ground level. Get a two or three gallon container. Fill with any soil. Insert the stems into the soil for a secure upright position of the stems. You may want to put a heavy rock in the bottom of the container to keep the wind from blowing it over. Place the pots near your feeders. When the birds land in the branches of the White Wild Indigo, they can rest there and feel protected against predators. Within minutes you will have more birds right next to your feeders feeling secure and safe. 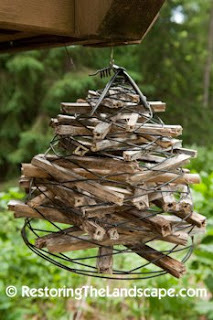 This will enable you to stand much closer to your feeders and observe birds up close. You can plant White Wild Indigo from seed and they will mature in two to three years or you could plant them as live plants and they will mature faster. Seeds should be scarified with sand paper to thin the hard seed coating if planted in the spring and place in a plastic bag with moist sand or vermiculite. After 10 days you may plant the seed. If planted in the fall they will not need scarification. They grow to about four to five feet in height and have beautiful white flowers up and down the sturdy stems in early to mid-summer. As they mature, they will develop black seedpods, which are very attractive. They are native from Canada to Southern Texas and Florida and throughout the central region of the U.S. They will thrive in most soils.